In Havana, there is a billboard. Socialisme O Muerte, it reads— Cuba’s semi-official national slogan: Socialism… or Death. Take your pick. And after fifty years of scarcity and struggle for which the Cubans have little to show but crumbling paseo maritimos and lean, weathered countenances, neither option seems to much appeal. In Cuba, the choices have never been easy. Fifty years ago, a young Fidel Castro and his ragtag band of bearded revolutionaries toppled the Batista regime with little more than a hand-me-down boat, a cache of junked guns and a vague rhetoric of revolution that hadn’t yet attached itself to any larger ideology, including communism. The commander spent the next half-century locked in a heated scramble to prove the viability of that revolutionary ideology to his people, and to everybody else, to insulate Cuba from the material threats of capitalism and imperialism, to demonstrate that another way was possible. Meanwhile, the world outside was busy altering its configurations, sometimes dramatically. Nine U.S. presidents came and went, and the larger project of communism faltered. The Soviet Union, long the strong arm of the communist machine, hardly protested when the two Germanys were reunited under a democratic system in 1990. The Eastern Bloc quietly collapsed soon after. By the first decade of the 21st century, over 75 countries had recognized Red China’s status as a market economy. And North Korea, the world’s last Stalinist stronghold, became a sad and baffling specter of what even mixed company could agree on as a failed ideology. Capitalism, it seemed, had won the war. Inarguably, and everywhere, things were changing. Everywhere, that is, except Cuba. Castro stubbornly continued to jam U.S. radio signals, to restrict internet access and foreign travel and immigration, to tow the party line of revolution and anti-imperialism, even after his Soviet allies folded and took millions in aid with them, leaving him hanging from the proverbial paintbrush. Over and over, the outside world predicted collapse. Over and over, the bottom did, indeed, drop out, but Castro clung to power, and he managed to retain a large measure of popular support throughout his tenure, even as the sugar crops withered and his people grew hungry and restless. 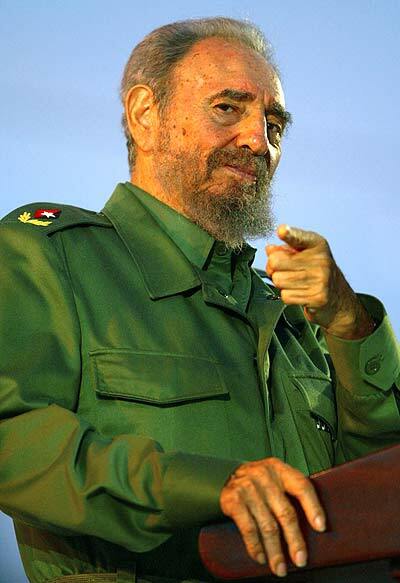 Two Februarys ago, at the age of 81, an ailing Castro finally resigned his post as president of Cuba. This resignation points to the possible end of this controversial project of Cuban communism, a state-directed ideology which has consistently elicited impassioned reactions from a vocal band of detractors and supporters across the globe. Castro’s legacies may be dubious—they are certainly many—but can they outlive him? The ideology-building strategies employed by Fidel Castro during his years in power seem odd, atavistic, and, to North Americans at least, sinister in no small measure. In many ways, it impossible to measure their success, but it remains equally difficult to prove their failure. When these strategies are filtered through the lens of general semantics, however, they assume a deliberate and surprising pattern. Hayakawa explains that “there is nothing that can be named, let alone described, without invoking the wraiths of an entire contextual system” (Hayakawa, 1939, p. 6), and Castro seems to have used this to his advantage. In Cuba, it appears, social control has been maintained in large through the strategic distortion of time and memory. The distortion itself is achieved through a pastiche of semantic methods: the compulsive invocation of high-level abstractions; the use of directive, affective language and purr- and snarl-words to guide social behavior; and the use of pre-symbolic language to ritualize and normalize ideology. Social control deals largely in the currency of hijacked remembrances. A dictator’s success depends also on the extent to which he is able to convince his people to suspend disbelief, to distrust their own memories and defer to the authority of a larger, collective memory, one that operates based on a different set of rules. George Orwell called it “doublethink:” the collective agreement to remember or forget at a moment’s notice, and even to forget that one has forgotten, should the situation call for it. And he who controls memory, controls identity. One way this is achieved is through the distortion of time. In Cuba, the time dimension is astonishingly malleable. There, the poles of past and future have outgrown their opposing stations, have expanded to encompass the entire spectrum of time. What “was”, and what is “to be” are no longer distinguishable from what “is”. Castro’s “revolution” has dragged on for fifty-years, and a glorious future hovers always just out of reach, a carrot on the proverbial stick. Memory and truth are the primary victims of this distortion of time, for to navigate such a shifting, non-linear reality is to wander through a hall of mirrors, an eternal maze of images and symbols which contain and reflect their own opposites, and the opposites of their opposites again. There, truth is filtered, warped, and prone to reverse itself at a moment’s notice. There, all is caught in a state of perpetual reinvention from which even the past and future are not immune. To see clearly, to see at all, one must suspend disbelief indefinitely, defer to the authority of a perpetual present, and to the demands of its keeper, its commander. Castroan rhetoric perches cautiously high on the ladder of abstractions, far from the cloying reach of questions, way up where there is little room for objective argument (Lakoff, 2000, p. 50). Lofty ideas, such as “revolution” and “imperialism” and “socialism” are compulsively referenced, but kept vague so that they might remain malleable. There is no place reserved within this abstraction for dissenters who might wish to enact their own revolution, for what word could even be used to describe such a movement? An “anti-revolution?” Doesn’t that just mean… nothing? Political appellations are also approached with a conspicuous measure of ambiguity. The ruling party of Cuba is officially called the “Communist Party of Cuba,” and Castro has fraternized at length with other communist leaders, yet official Cuban rhetoric rejects the term “communist,” in favor of a less loaded one: “socialist.” Many of the national slogans also promote the virtues of socialism, an ideological system to which the Cuban government can claim little resemblance, and this jumbling of terms also serves to distort perception. These various forms of “word-magic” (Hayakawa, 1990, p. 98) short-circuit the viability of disagreement. They direct the process of classification, and “as soon as the process of classification is completed, our attitudes and our conduct are, to a considerable degree, determined” (Hayakawa, 1990, p. 108). How, after all, can you question a principle so big it encompasses the entirety of your reality? How do you chase a shadow? How do you disagree when there are no words with which to express that disagreement, or even with which to think about it secretly? It can’t be easy. Hayakawa explains that the propagandist’s most powerful weapon is “his ability to create automatic, associational responses” (Hayakawa, 1939, p. 13), and directive language, which “attempts to control, direct or influence the future actions of fellow human beings with words” (Hayakawa, 1990, p. 65) is a primary means of achieving this. Fidel Castro is infamous for his lengthy and impassioned speeches (he still holds the record for the longest-ever address to the United Nations) and this oratory skill became a primary means of constructing, transmitting and reinforcing a revolutionary narrative during Castro’s tenure. The commander’s public diktats were regularly peppered with directive utterances intended to guide the behavior of citizens, to tell them how they might “bring about desirable events and avoid undesirable events” (Hayakawa, 1990, p. 67). The imperative form was used regularly, and Cubans were called upon to carry out the ideological and practical work of the revolution in both the public and private spheres of their existence. Fear and distrust of the world outside, especially of the United States, was painstakingly cultivated, and Cubans were constantly urged to fight the vague, sinister force of imperialism. But to be successful, to maintain control of his people, Castro couldn’t rely solely on vague, pre-constructed platitudes. He had to learn to direct reality intuitively. Each moment called for improvisation, and great care: “If facts move them, facts must be given; if noble ideas move them, we must make our proposals appear noble; if they will respond only to fear, we must scare them stiff” (Hayakawa, 1990, p. 66). He assumed an affect that was ominous or exultant, or equal parts both, depending on the circumstance. This directive language of social control “imposes patterns of behavior” (Hayakawa, 1990, p. 68) in part by utilizing the affective elements of language: “dramatic variations in tone of voice, rhyme and rhythm purring and snarling, words with strong affective connotations, endless repetition” (Hayakawa, 1990, p. 68). Of these affective elements, purr- and snarl-words are perhaps the most frequently invoked. Members of Cuba’s small dissident movement are regularly referred to as gusanos, or worms. Castro, on the other hand, is referred to by a variety of nicknames that imply strength and endurance, including “the commander” and “the horse.” The time of scarcity following the collapse of the Eastern Bloc, when the black market exploded and many average Cuban women were forced to moonlight as prostitutes, is regularly referred to by the euphemism, The Special Period. According to Hayakawa, the rituals accompanying directive utterances serve solidifying functions. These rituals may include appeals to supernatural powers, implicit societal punishments and compulsory acts of repetition. In concert, these rituals have a “deep effect… on memory” (Hayakawa, 1990, p. 70). In Cuba, supernatural powers are regularly invoked in written and spoken rhetoric. The twin deities of Socialism and Revolution are held up as gods to be worshipped. Morale is also bolstered by strategic and romanticized references to revolutionaries past, who have been shaped into demi-gods in their own rights. Perhaps the most recognizable and pervasive of these heroes is Che Guevara, an Argentine Marxist revolutionary and close ally and confidant to Castro during and after the initial revolution. The story of Che’s heroic life and tragic death at the hands of the C.I.A. in 1967 forms an integral storyline in the Castroan narrative. Castro’s attempts to build a cult of personality around Guevara have been so successful that the revolutionary’s bearded countenance is now recognized and adored not only in Cuba, but also across the developed and developing worlds. His likeness appears on everything from lighters and bumper stickers to string bikinis. However, it has become something of an empty signifier beyond the boundaries of Cuba, and it seems a strange irony that U.S. citizens are among the most enthusiastic consumers of Che-themed products. Compulsory acts of repetition involving pre-symbolic language are another hallmark of Castro’s directive endeavors. The catchphrases are endless, affective, and pervasive, plastered across a thousand Havana billboards, spray painted on walls and drilled into the mind: Socialism or death! Homeland or death! We shall overcome! Such catchphrases regularly bookend the commander’s impassioned speeches. In a fit of revolutionary fervor, he might jab his fist into the air and invoke a higher power by throwing down an oft-repeated rhetorical challenge: “The Revolution asks this of you!” They also dot the physical and semantic landscapes, acting as subliminal visual and auditory cues, living ideograms. Towering steel sculptures, colorful billboards and strategic graffiti all work in concert to remind Cubans that the revolution is very much alive, and organic, and all seeing. Recitation forms an integral part of the Cuban education, and schoolchildren are regularly required to memorize and recite the catchphrases of the revolution. However, it is important to note that the cultivation of such knee-jerk ideological reactionism hasn’t been confined to the parameters of the island. In fact, it is equally difficult to tease out a viable truth from the emotionalized rhetoric emerging North of the border. The U.S. imposed a crippling and widely criticized trade embargo on Cuba back in the 60’s when it became clear that Castro planned to align himself with the Soviet Union, and the ban on U.S. tourism to the island remains in effect to this day. For 50 years, the ideological push and pull between Cuba and the United States has assumed a carnival atmosphere of chair-throwing, symbolic gesture and mutual damnation. Fantastical plots abound: some claim that the American government has attempted to assassinate the commander 600 times or more, and that U.S. agents even once hatched a plan to pack one of Castro’s beloved cigars with explosives. In a 1959 interview, Castro vowed to Edward R. Murrow that he wouldn’t cut his beard until he had fulfilled his promise of creating a fair and just government in Cuba. In response, rumors go, the CIA concocted a mysterious serum that they hoped might cause the beard to fall out prematurely. The U.S. media seem baffled by the whole situation, and news outlets tend to plop themselves down on one side of the ideological fence or other and stay put. Last year, Forbes listed Castro as one of the richest men in the world, estimating his worth at $900 million. Castro was outraged, called the claim “rubbish,” and even vowed to resign if anyone could prove its validity. Think tanks parading as objective sources of information receive funds from the American government for digging up dirt on Cuba, while radical pockets all over the world praise Castro heartily for standing up to the Americans and extol the virtues of the Cuban way: universalized health care, an astonishingly high literacy rate, a clean environmental bill of health. The chatter on both sides is noisy, argumentative and bloated with accusations, but both camps seem more committed to discrediting the claims of the opposition than to producing any kind of useful insight. Soon, though, the stalemate may reach its denouement. The commandante, who spent fifty years drawing and redrawing maps, working his gnarled fingers through a scrappy beard as he recorrelated the territories of future and past, has retired to his chambers. Some speculate that he is already dead. Fidel Castro achieved the power to wipe clean slates of memory, to deify and demonize, to change his mind, over and over, to “choose words, assign meanings,” (Lakoff, 2000, p. 40). For 50 years, Cuba’s future was wrought by the indelible authority of that commander and his army of meaning. At the helm of a perpetual present, he built a reality which had the power to override its own commands, ceaselessly. And now, the political, economic and ideological vacuum his absence has created has many shifting uncomfortably, impatiently. What will the next move will be? And who is to make it? Such questions loom large, and remain exceedingly difficult to answer. Time will tell, they always say. But in Cuba, time has proven the most unreliable of narrators. What happens when a society that has consented to such a suspension of time, to a cult of perpetual now, to the remapping of everything that ever was or will be, over and over and over, is asked to look to the future? How do you plot a course forward when the mirrors have reflected nothing but more mirrors for so long? And as the world speculates on the potential configurations and reconfigurations of a Castro-less Cuba, the disturbing question arises: how to break the spell? How to move forward after years of ideological suspension? Cubans under Castro were never allowed to construct a future. They spent the last 50 years participating in a culture of perpetual, voluntary disbelief, lured into the cult of the eternal now, whose surface is as slippery as a hard-boiled egg. No permanent meaning could latch on. It was wiped clean, over and over. When belief is suspended indefinitely, it seems, the clocks stop ticking. Or perhaps they tick backward and forward, both at once, for the Cubans seem lost in an eternal prologue. Through the ideology-building directives of the commander and his state-run media system, they’ve been dragooned into ignoring a confusing and unsatisfying present, moved to work frantically to construct a future that will never come, to build a non-place inhabited by their non-selves, a vague and dim landscape of chimeras and endless vanishing points that is always just beyond their grasps. For so long, an unsatisfactory present was made bearable by a future that Cubans were irresistibly compelled to imagine into being. Venceremos! We shall overcome! Work harder, came the command. Hope harder. Like the war prisoners who dug their own graves, the trap was set by those whom it was intended to catch. In Havana, there is a billboard. Socialisme O Muerte, it says. This, or Death. Take your pick. Underneath the billboard, life ambles forward. It goes on rickety old bicycles, two or three to a seat, it goes in wheezing taxis held together by duct tape and hope. It slips away through crumbling blue facades and chipped yellow doorways to feed on rations of dry, broken beans and carne texturizada, sating itself on an indigestible reality. Sometimes, perhaps, it grows brave, pushes an old tire out into the water, and paddles frantically in the direction of anywhere else. Mostly, though, it just sits and waits. Hayakawa, S. I. (1990). Language in Thought and Action. New York: Harcourt, Inc.
Hayakawa, S. I. (1939). General Semantics and Propaganda. The Public Opinion Quarterly, 3(2), 197-208. Lakoff, R. T. (2000). The Language War. Berkeley: University of California Press.